In the previous post, we have learnt how to create and write to Excel Files using Apache POI APIs. We have used XSSF API to write data which is used for xlsx formats.In this post, we will see how to read the data from Excel file. We will read the same excel sheet data, which we have created in the previous post. Step#1 Create File object and pass the file path as an argument. This file object will be passed to FileInputStream object as given below. Step#2 Pass this FileInputStream object to the XSSFWorkbook objects to get the instance of Excel workbook. Need to access the desired sheet by using method ‘getSheet’. Step#3 Count the total rows and columns present in the excel sheet. Step#4 Get the access of Row and Column by using the below statements. 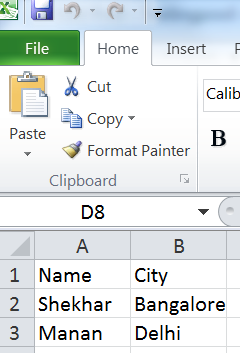 Step#5 The data in the Excel sheet can be in different form like String, Numeric,boolean etc. We need to verify which kind of data it is and on that basis we can print the data. Here is the full code you can use. You just need to replace the File path ,rest it will take care.